With the new exhaust emission rules well and truly operating, UD Trucks has revealed the final piece in its line-up puzzle, with the release of the long-awaited upgrade for the MK5 and MK6 trucks. With three different base variants it is now possible to mix and match eight different versions, including four or six cylinder engines and leaf-spring or air-bag suspensions. The new MKs complement the recently released PPK 9 and 10 models, as well as the GW series of heavy-duty trucks that hit the streets earlier this year. 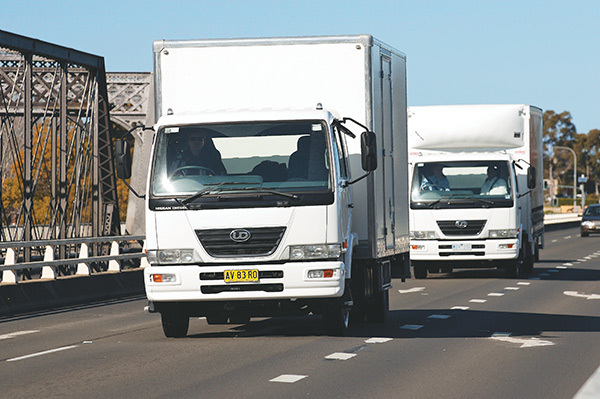 While truck sales have run at near record levels for the previous 18 months, recent indicators show the market has started to come off the boil, although UD’s marketing manager, Shannan Taylor, says the company remains upbeat about opportunities for the new range. Taylor says the revised sales forecast for medium-duty trucks for the rest of 2008 predicts a 1.8 percent drop in sales against 2007, or, in real terms, total sales of 9,750 against the 9,950 sold last year. 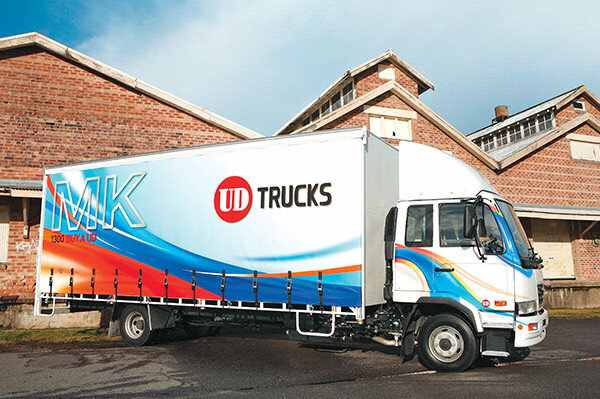 The biggest problem UD faces is it is nine months behind the competition with the MK launch, particularly with Isuzu performing so strongly, although Taylor draws confidence from the fact UD has maintained its share of the market, where competitors Hino and Fuso have actually lost ground. According to Taylor the delays were a combination of factory issues in Japan and also with Federal Government locally, however, he says these have all been resolved. Taylor says UD is currently enjoying conquest sales to fleets that have never before purchased its trucks, and is confident the new MK range will continue that trend. John Bushell, UD Trucks general manger, says the new models deliver a flexible approach for transport operators with high levels of productivity and efficiency. "Like its bigger brothers the new MK range takes a big step up in every area. "The addition of an Allison automatic option on the MK6 will greatly add to the appeal of the UD product, particularly against our competitors, some of whom do not feature an automatic while others are offering AMT trucks." Taylor says the differences compared to the previous models include making ABS and EBS brakes standard on the MK5, as well as boosting the payload by 1,300kg and increasing the combination mass to 14.9 tonnes. While the MK6 benefits from a power increase to 228 horsepower and the availability of an air-suspension seat, and the MK6 plus garners a 258 horsepower engine and standard ABS and EHS. "The inclusion of ABS and EHS and automatic transmissions to the MK range is part of a comprehensive active safety package aimed at keeping the truck out of an accident," Bushell says. "Our aim with the entire new UD range has been to provide high specification trucks which lift the safety of both the driver and other road-users to a new level. "There is a strong demand across the industry for higher levels of safety which is in response to the need for greater occupational health and safety," he says. Standard equipment across the range includes ABS, EHS Easy Hill Start, air-conditioning, remote central locking, cruise control and an air-suspension seat, making the new MKs a comfortable place to spend some time. Taran Mutch, UD’s national service manager, says the Easy Hill Start was deliberately only offered on manual models, as UD believes it is not needed on the automatic versions, because of the assistance offered by the torque converter. "However, all of the manual models do feature Power Shift, which sees the air assistance reduce the operator effort to shift gears from 12kg down to just 6kg," he says. The other difference between the auto and manual models is the diff ratio; with manuals running high profile tyres and a 4.3:1 ratio, compared to autos, which use a 4.1:1 ratio in combination with low profile tyres. "We are also testing a 4.8:1 ratio for noise limits," Mutch says. As part of the launch program, journalists were given the opportunity to drive the different models, all of which were loaded close to the maximum weights to simulate real world performance. The four cylinder MK5 is powered by a 175hp/500Nm common-rail turbocharged engine, while the larger variants feature a similarly equipped six cylinder engine, with the MK6 offering maximum power of 228hp and torque of 686Nm compared to the MK6 Plus, with 258hp and 794Nm. 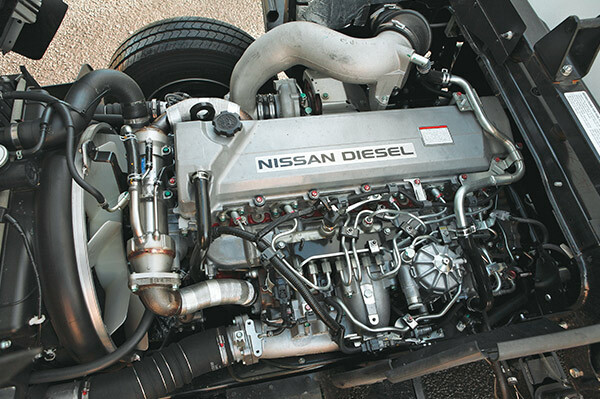 Mutch says the engines used in the UD range are manufactured by Hino in Japan to a UD specification, which includes cooled Exhaust Gas Recirculation, common-rail injection and variable nozzle turbocharging (a technology that first appeared on UD trucks in 1995). "We don’t feel it is embarrassing by using Hino, it provides us the capacity to include extras like ABS and EHS to operators," Mutch says. According to Mutch, the PTO fitted to the rear of the engine offers 225Nm of torque continuously, rather than at its peak. He says the engine is currently compliant with US04, but he does not expect to see a Euro 5 engine before 2011. Taylor says the optional Allison automatic will be a major marketing advantage as it promises to enhance the truck’s productivity and should satisfy the growing demand for automatic trucks from major fleet and business operators. "The increasing demand for automatic trucks, not just in traditional operations such as garbage compaction and concrete agitators but increasingly in delivery and distribution operations, means the Allison Automatic equipped UD MK will be an important weapon in our sales arsenal," Taylor says. "Additionally, operators are finding it hard to recruit and keep drivers, and factors such as trucks equipped with automatic transmissions will broaden the appeal of a company’s fleet to drivers as well as enabling a company to attract drivers from a broader base." Comparing the Allison automatic to the AMT offered by competitor Isuzu, Taylor says the automatic is more reliable and cheaper to repair, and can shorten driving time by up to 10 per cent. Bushell says research shows that automatic transmissions will make a significant contribution to the effective and efficient operation of any distribution fleet. 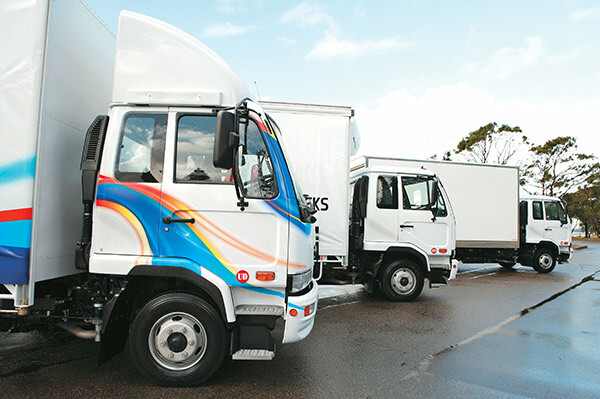 "Most major operators are already aware of the advantages of automatics and many of the major transport operators have made the commitment to automatics for urban distribution work in particular. "Our testing has shown significant increases in overall efficiency, durability and ease of operation. It really is a major boost for any operator," Bushell says. Allison research shows that with constant drive to the wheels, a vehicle equipped with an automatic transmission can complete its city based route an average of 10 per cent faster than one equipped with a manual or automated manual transmission. Once moving, electronic control of shift points and early engagement of lock-up helps the powertrain operate in its most efficient mode at all times, reducing engine speeds to deliver improved efficiency, lower emissions, less noise and reduced wear. Taylor says automatic gearboxes are the unit of choice for fleet operators, where they offer greater driver retention, and unskilled drivers are able to obtain good operating results. "We believe we are now on par with Isuzu," he says. The first thing that quickly became apparent was the steel leaf-springs struggled to match the performance of the air-bag-equipped models. The leaf-springs produced a jarring ride, confirming the only time buyers would specify them is when its a necessity. 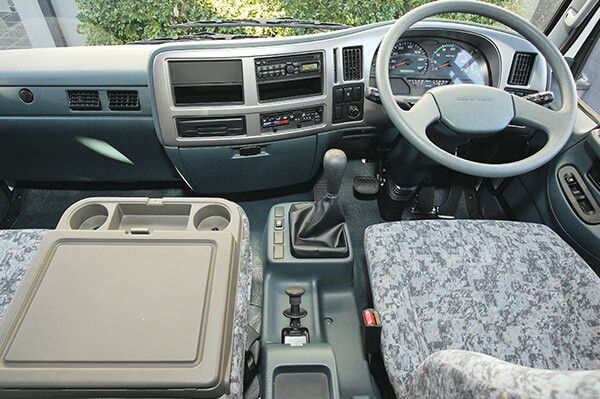 The cab layout is an improvement over the previous version, with a comfortable seating position that puts all of the important controls within easy reach, regardless of driver size. From a driver comfort perspective, the air-conditioning system works well, with sensibly placed vents blowing plenty of air across the driver and passenger. While three-up seating is available, the middle seat only has a lap belt. The middle seat folds down to turn into a handy work table, complete with a pair of drink holders. The field of view is good, the door pillars barely intruding into the driver’s vision. I did find the driver’s door mirrors made it difficult to see turn signals at traffic lights, particularly if you are sitting behind another truck. The air-assisted gearshift in the manual versions is both light and accurate, while the clutch is equally light to use, there is no need for an elephant’s leg, even after plenty of gearshifts driving through urban areas. While the steering wheel is height and reach adjustable, for long-legged drivers there is a problem when coming off the clutch: your left leg tangles with the steering wheel. You need to twist your knee to miss the wheel, however your knee then obstructs the gear lever in third and fifth. In the auto there is no problem at all, you simply plant your foot on the footrest, and there it stays, nice and comfortable. The power-assisted steering is good, it makes light work of directional changes, although there is some vagueness around the straight ahead position. Noise suppression in the cab is good, even when the engine is working hard. The engine itself doesn’t sound harsh unless pushed hard into the top of the rev range. The five-speed Allison LCT 2500 auto was a smooth performer, with comfortable shifts both up and down as required, the ability to keep the throttle open on uphill climbs meant it was simple to maintain the road speed. As part of the launch UD included a heavier PK tipper in the drive program. This revealed a shortcoming in the standard six-speed gearbox which led to plenty of shuffling of the gears to keep the road speed up, although selecting a nine-speed would fix the problem. Aside from the need for more seat and steering wheel travel, the new MK range acquitted itself well. Click here to find UD trucks for sale. Click here to find new specs for UD trucks.